Latest post Sat, Oct 27 2018 10:06 AM by Armin Kelichhaus. 31 replies. Can´t start to work today, because although I have an annual subscription, Media Composer can´t be activated: 200 Can not link this device... Hell. What to do. Send my client home? I have a Dongle based system, so I can work. However, if I open Application manager it says, That I have no abo for this account, even when my license lasts until June 2019. There is definitely something wrong at Avid. I reported the problem to our IT team. I will keep you updated. Thanks RalphC. But this was no fun. It is not solved for me. I just tested Application Manager with a restart, and it still shows the information, that I have no abonnement for MC. your efforts solved the problem. The question is still, what was the reason for this obvious corruption of the application manager data. May be caused by MC Beta build? Today "Feeds" says version 2018.9 of MC is available. Although I have an annual subscription, my application manager doesn´t show the update option, not even for 2018.8. I got stuck with Version 2018.7. 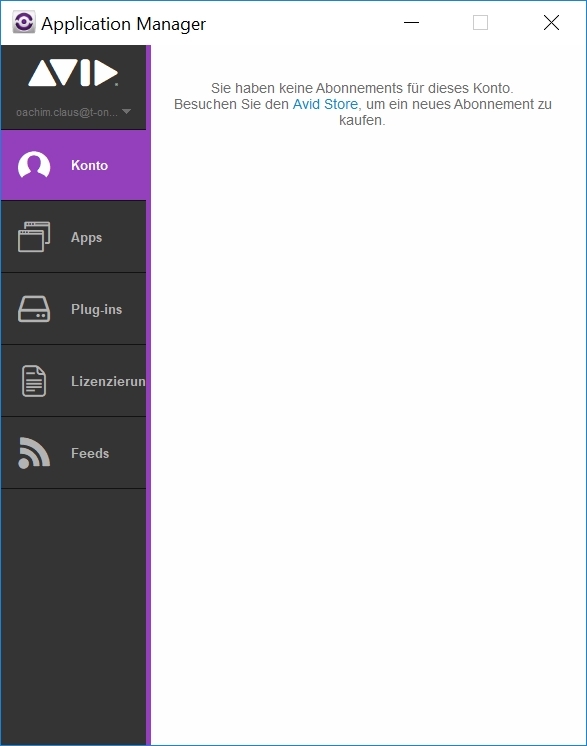 In fact in the "Apps" section I don´t even see the Media Composer App, only the "Application Manager". Media Composer is in the plug-ins section only. Is this correct? It actually was an issue on our server end. Sorry that it affected you. Since there was a server issue - I suggest you stop the Appman and AppMan Helper app's and then retry. You can also clear cache in Appman too. If that doesnt work, you can download 2018.9 from the DL center but I would rather we figure out why your appman is NOT seeign the latet versions like it should. Thanks Marianna for your quick replay. I have cleared the Cache file, restarted the AppMan, my account was synced again, I got the News, that 2018.9 is available, but I can´t update. My actual Verskion is 2018.7. So I think, 2018.8 ist missing too. By the side, should I see the MC App in the Apps section of the AppMan? There is only AppMan 2018.8.1. installed. And yes I think, that all happend after the server issue. What shall I do? Uninstall AppMan and Helper? Uninstall 2018.7 completely. If you did install 2018.9 or 2018.8 - uninstall that too. Do the same for Appman. Then start over and see if you can get it via AppMan.